Our Session is comprised of elders, women and men, who have been elected to serve for designated terms on the leadership team for Cold Spring Presbyterian Church. 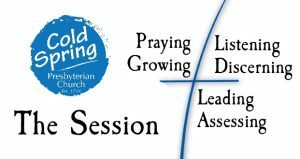 The session meets monthly with the pastor to provide leadership to the worship, mission, and community ministries of Cold Spring Presbyterian Church. Summary Notes from each meeting are distributed to the congregation. The ruling elders are listening, assessing, and leading this congregation in an intentional transformation process. Our mission focus is to build spiritual energy within our communiuty of faith so that we positively impact our community at large with the Good news of Jesus Christ. Everyone has a part to play, gifts to contribute, prayers to offer, support to invest, to fulfill our unique mission in our greater Cape May community. Our Transformation Pastor, the Rev. Dr. Kevin Yoho, is the Moderator of the Session. Mr. Robert Riehl is the Clerk of Session. We are ready to serve you and your family. Ruling Elders on Session: Class of 2019: Kevin Beare, Martin Bowne, Rob Riehl, Marjorie Wetherill. Class of 2018: Vickie Banks, Pamela Barsby, Charles Keister, Tom Imperato, Robert Olivieri. Clerk of Session: Rob Riehl. Moderator: Dr. Kevin Yoho. Deacons Class of 2019 Renie Grier, Janice Lewis. Class of 2018: Mary Imperato, Jim McCaughey, and Moderator, Neil Oberlin.